TuneUp Utilities has long been recognized as the most complete Windows Utility Toolbox. It consists of a vast number of tools for the enhancement and maintenance of Windows PC. With every new version it is getting better an better. Recently TuneUp Utilities 2013 has been released with loads of enhancements over the previous version 2012. It has 33 powerful tools to get your PC in top shape. 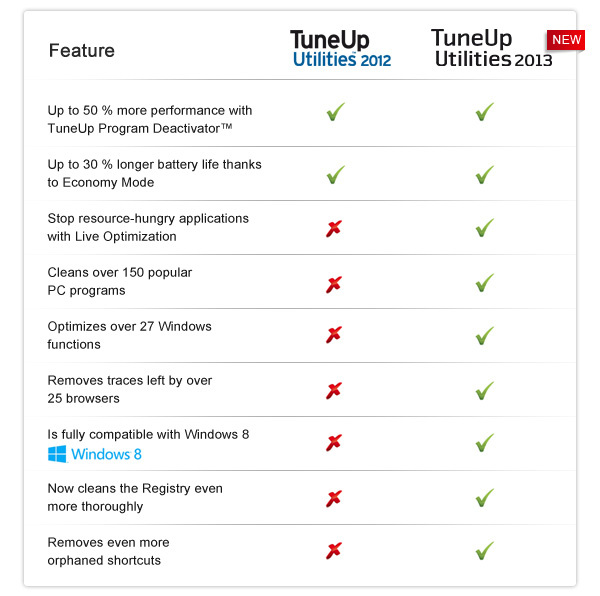 And yes you can use TuneUp Utilities 2013 on Windows 8 PC too. It is 100% compatible with the new OS from Microsoft. TuneUp Utilities 2013 offers enhancements over its predecessor. Some new tools and some enhancements made the new version much better. An overview of the differences can be found in the following screenshot. The differences in detail are the following. Ultimate cleaning power: TuneUp Disk Cleaner, Browser Cleaner, and Shortcut Cleaner! You can find the super tools in the new “Clean up computer” category of TuneUp Utilities™ 2013. TuneUp Disk Cleaner: Removes residual data from over 150 popular programs. What’s more, it rids almost 30 important Windows features, such as Media Player and Microsoft Installer (MSI), safely and effectively of leftover data that are no longer needed. TuneUp Browser Cleaner: The brand new TuneUp Browser Cleaner feature gets rid of browser traces left behind by over 25 browsers, including Internet Explorer, Chrome, and Firefox. By removing Flash cookies and compressing browser databases, it cleans even more thoroughly than the browser itself. TuneUp Shortcut Cleaner: Now finds and removes even more history lists and orphaned data entries in many programs and in Windows® itself. On a 17″ multimedia laptop only a few months old, TuneUp Utilities™ 2013 discovered over 37 GB of cleaning potential! That’s an amazing 11,000 files that could safely be deleted. On a PC used mainly for gaming, over 46,000 data remnants were identified with a total file size of 17 GB. That means, TuneUp Disk Cleaner 2013 found up to 6x as many files as the previous version. Compared to the competition, that’s around 30x as many GB of data that were removed! TuneUp Live Optimization 2.0: Better performance than ever! Using a CPU stress tool, all four cores of the test computer were pushed up to 100% capacity, enabling Live Optimization to unleash its full potential. At full capacity, conversion of an HD clip took fully 110 seconds – with Live Optimization 2.0, that time was reduced to just 14 seconds! Converting a one minute-long MP3 file was slowed down so much at 100% CPU usage that iTunes froze for over 2 1/2 minutes. With Live Optimization 2.0 switched on, however, iTunes took just 4 seconds to convert the file. Compatible with Windows® 8: ready for tomorrow! Over time, even Windows® 8 can become sluggish. Multiple program installations and leftover data as a result slow a system down and make it more unstable. You can put an end to that by opting for the TuneUp Utilities™ 2013 power package now. That way, you can ensure your brand new ultrabook, tablet, or PC stays in top shape, even when running Windows® 8. A 3 PC license of TuneUp Utilities 2013 costs $ 49.95. But you can download the evaluation version from any of the following links. You can get 40% discount on the purchase of TuneUp Utilities 2013. Go to the purchase page and apply the coupon: JJG-DDT-SU5 or, use this link to purchase.